When I take the bus to SLC on Tuesday and Thursday mornings, it's always a mad rush of drama and fatigue. The bus leaves at about 6:30AM so I have to be up and then out the door pretty early. Because I like a close call, I'm usually out the door about 2 minutes later than I should be (I think this part of me is a manifestation of rebellion, resulting from the number of times Bob made us 6 hours early to everything we ever attended growing up. Although in my ever growing maturity and acceptance of adulthood, I'm starting to see the wisdom in the 6 hours early rule for anything I need to attend in Provo that requires me to find a parking place). Then the race begins. By the time I hop onto the road where I park and catch the bus stop, I can usually see the bus in my rear view. Then starts my first of a series of judgment calls about whether or not I'm going to have enough time to park and then run to the stop or whether I should drive on to the next stop after I've gained a little more distance on the bus. Of course during this whole process I like to imagine that I'm Jack Bauer in 24 and there are terrorists aboard the bus (which, let's be honest, there might be). Last Tuesday was an ordinary morning up through the bus chase scene, until I actually got onto the bus. Whenever I climb aboard I do a quick cursory glance to decide who I'm going to sit by. To back up a bit, when I get on the bus in the mornings, there are always enough empty seats that I could go and sit on a completely empty row. The express bus that I take has seating like a tour bus so it's relatively comfortable but if you are sitting right next to someone, there isn't a lot of breathing room, so it's always nice to get a whole row to yourself. But what I have found (and for reasons I'll never be able to explain, it took me about four months to figure this out), by the time the bus makes its last stop in Provo, the thing is entirely full and nobody has a row to themselves at all. Recently I decided that it was best to sit right next to someone from the very beginning because at least then I could take control of the bus-mate decision-making process and not get stuck next to talkative crazy stinky guy who is the size of seven people, falls asleep on top of whomever he is sitting by, drools, and then gets all kinds of cranky when you ask him to move so you can get off at your stop. Unfortunately I always feel a little strange when I do sit next to someone despite the abundance of empty rows and I'm never quite sure whether I should turn to them and explain the situation and let them know that what I'm doing is for both of our benefit (because I am not stinky, talkative, cranky, drooling, or the size of seven people) or just let them wonder whether I'm in love with them. So on Tuesday I did my cursory glance, looking for someone who was small, clean, and quiet so I wouldn't have to touch, smell, or talk to anyone on the dark bus at 6:30 in the morning. I saw a girl toward the front that fit the bill and I plopped down next to her and decided against explaining the process. And so we rode. We rode for almost an hour and half right next to one another. Because the seats are so small and close together with no arm-rest between them, we rode arm against arm the entire way and didn't say a word to one another or look at one another. Finally we approached my stop and I reached down to gather my things and noticed her security badge with her name. For an hour and a half I had been sitting next to my cousin and neither of us ever noticed. And this wasn't one of those cousins that I see at family reunions and wonder whether they are actually related or just crashing the place for the food (which would be a mistake--most family reunions I've been to do not have great food and the vast majority of the pot-luck items are questionable at best, toxic at worst). In fact, this is one of my very favorite cousins. I turned to her and tapped her arm. She looked at me and said in a tone that meant she was truly disappointed in herself, "what? Are you serious?" We said a quick hello and I jumped off the bus. On Thursday she saved me a seat. I'm happy to have a bus friend now who is consistently small and clean. I've lost the talkative battle but I'm ok with that. 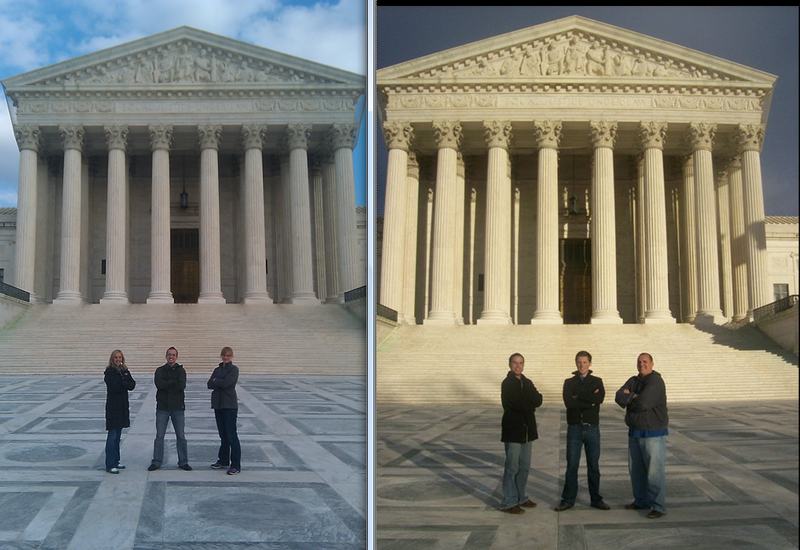 Last week my Law School travel group went to Washington DC for our trial advocacy competition. As expected, it was full of laughs and strange. We left on Wednesday afternoon after raiding the CSO of all it's candy and cake, even swiping a chocolate box full of an assortment of chocolates we later found to be as confusing to decipher as figuring out why people watch Glee. I got flack for changing my seats on the plane so I would not sit by anyone (friend or stranger) because I had every intention of getting my first wink of sleep in 12 years on every leg of our trek. About half-way to DC, Alex found me on the plane and offered me some chocolate out of our gifted chocolate box. 3/4 of them had been gnawed on and placed back in the box (courtesy of Mary Beth and Joseph who "just wanted to see what kind they were"). Every single chocolate looked exactly the same, so I couldn't blame my friends and their rodent-like-nibbling-habits for not being able to effectively use the chocolate key card in the box to find out which one was apricot and which one was dung. I then nibbled on the remaining 1/4 only to remember that I don't really like chocolate that much. We arrived in DC and immediately put Jordan in charge (because he is the most responsible human-being any of us has ever met. I bet he has food storage and a 401k (whatever that is!)). Jordan got our rental van and drove us to our hotel. Upon arriving, we discovered something about the van: we think it may have been the main character in that horror movie from the '80s where machines take over the world (Maximum Overdrive?) because it did things without being prompted, always at the inconvenience of every one of us. For example: As Jordan and I exited the vehicle from the front to go check into the hotel, all the doors locked and the remaining four (grown-ups, mind you) suddenly found themselves trapped, and apparently convinced that they were in sealed airtight capsule with a limited oxygen supply. I watched as the mild frustration turned into all-out-panic in a matter of 60 seconds which resulted in four terrified people pounding on windows and screaming. I tried to explain over their yelling that there wasn't much I could do until they unlocked the doors but it never sank in (nobody thinks clearly mid-panic, and this was panic). Eventually the doors magically opened on their own and four exhausted adults fell out of the vehicle gasping for air; the van seemed to be laughing. We trapped ourselves in our hotel rooms all day, frantically taking care of last minute preparations for our first round that would begin that night. Strangely Jeff and I had a room that was about 35 times bigger than anyone else's, so we became the trial ad headquarters. The first round was fun and stressful, lasting almost five hours total. Jeff was my partner and Alex acted as one of our witnesses. We had to do direct examinations of three witnesses so the other two were provided by the competition and I got 15 minutes before the round to sit down with them and try to figure out what they were going to say. Combine that with the fact that we had no information on the defense witnesses and so had to wait literally until the moment it was time to cross-examine them to figure out what the heck we were going to say, and you understand that it was a pretty stressful competition. We drove out to the DC temple and some waterfall during the day (Jordan swore the official name of the place was "The Great Falls" which then prompted a series of jokes about what else they could have named the place. This, of course, went on for about 30 minutes longer than it should have . Options included: Mediocre Falls, Not As Great As Great Falls, and Not Worth a Trip By Itself But If You're In The Neighborhood Maybe Take A Minute And Stop By Falls). Then it was back to the hotel to tweak our preparations for the Friday night round which went more smoothly than the night before. After the round we had a small banquet to attend where they recognized and had us clap for every single person who has ever lived, before telling us who was moving on to quarter-finals from the 24 teams that originally started. Four prosecution teams and four defense teams moved on. Two of those prosecution teams were both of our BYU teams. We were excited and proud of how we had done. The competition gave us some new information that night (a photograph and a dr.'s note) and sent us home to prepare to compete early the next morning. It was a sort of late night, partly because we were frantically planning, but also because the several teams from other schools that were staying on our floor and didn't make it to quarter-finals got unbelievably drunk, pounded on the walls, and screamed obscenities at us and about our religion until about 3:00 AM. It didn't bother me too much because I don't sleep anyway so I appreciated the entertainment and found myself grateful once again that I go to a school with nice people that would never, ever, do any of that (at least I like to think so). I'm positive that the schools these people were representing are full of their own nice people as well; it's too bad the schools didn't draw from that pool of people to choose who to send to represent. Quart-finals began bright and early. It was another 5 hour round with a slightly aggressive team (one who posted on its school website that they defeated us, despite that not at all being true--seriously people, the Internet is accessible to everyone and if you post lies about something that is verifiable, you're taking a risk). Mary Beth and Joseph moved on to semi-finals but Jeff and I were done (always a bitter-sweet thing--bitter because victory is sweet, and sweet because 5-hour rounds are bitter). Joseph and Mary Beth competed in semi-finals against a team from the same school as the team we went up against in quarter-finals--another one whose social skills and professionalism I was also not impressed with. Mary Beth and Joseph didn't move on to finals so we were finished with the competition on Saturday afternoon, and proud of how we had done. 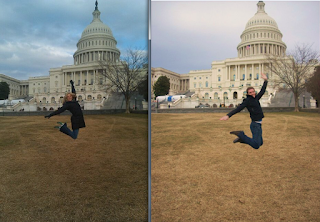 Our flight didn't leave until the evening so we had most of the day to tour our nation's capital. 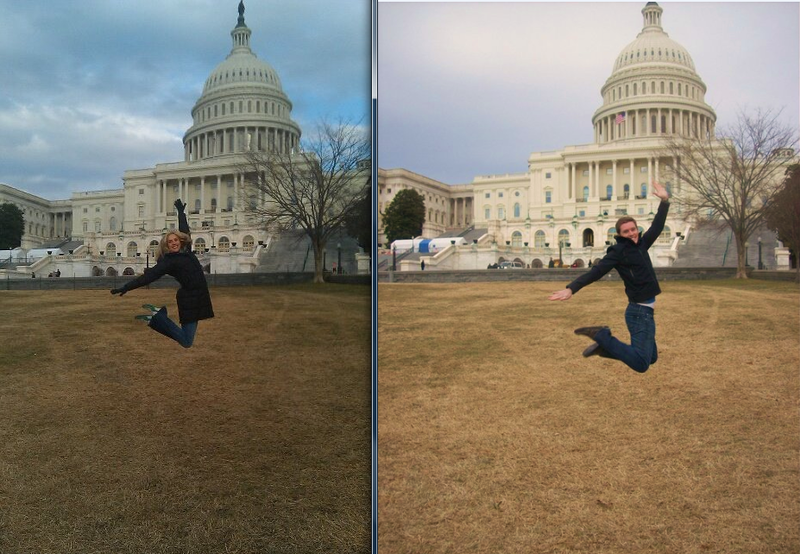 Some of our friends had gone to DC the weekend before for a different competition and had taken pictures of themselves at various well-known locations. Corey took the better part of a day and cleared her schedule to scrapbook these pictures on loose pages to make a picture scavenger-challenge for us (put the word "scavenger" into the name of any activity and you'll instantly have 100% of all Mormons within earshot completely on board). We rushed around to the locations throughout the day, setting up the shots perfectly, posing in all the right places and in all the right positions until it was time to jet back to the airport. At the airport, Alex caused what had to be the biggest overreaction I've seen since the weather people told us it was going to be "snow-mageddon" last November in Utah and the entire population of the state boarded up their windows, hid in their bomb-shelters and gnawed through 6-months of their 1-year food supply, only to not even see so much as a cloud blow in. Alex did the unthinkable at the airport: she forgot to take a small plastic cup of mandarin oranges out of her carry-on. Can you even imagine what could have happened had they not noticed those oranges? Unthinkable. If you're Catholic, you probably just crossed yourself. If you're Mormon, you probably just said "Oh my heck." Anyway, after running the oranges through some test, TSA was absolutely convinced they were laced with explosives, apparently enough to take down an entire plane. So in response, one TSA agent began the first of several shockingly intrusive frisks while the other five of us stood on the other side of the glass and stared, noticing when Alex's eyes opened a bit wider every time Ms. TSA would discover a new area of Alex's body that Alex didn't know existed. After each frisk, they tested the oranges again which of course still tested positive for explosives, which would subsequently lead to yet another frisk. Our conversation on the other side of the glass turned from, "how could oranges possibly cause all of this" to "is anyone else a little nervous to travel with Alex?" Eventually she passed (whatever that means) and we walked to our gate, some of us feeling a bit guilty that we were still wondering whether Alex was actually a terrorist, the others upset that they didn't get a frisk because it looked a lot like a full body massage (except more intrusive). It was good to make it home but sad to bid farewell to my friends with whom I will not get to spend every waking second ever again. This, of course, was just one more farewell in the middle of a string of farewells that will climax in April. And it's all too bad. It's too bad that I don't quite know how to savor strange experiences in a way that stops them from feeling like they are slowly slipping away. It's too bad that I can't make all of this last another 100 years. It's too bad that in a few months, we'll all be going our separate ways and it's too bad that all our separate ways can't include one another. It's too bad that this has all been so good because if it had been just another phase of life, it would be so much easier to anticipate the end of something mediocre and the start of something new. But this hasn't been just another phase of life. It's been something that has meant so much more to all of us who have found out how it feels to stand together and supported when the world rears its ugly head. It's been something that we'll all look back on with excessive amounts of anxiety and fondness, both of which blend together and ferment into a potent nostalgia, growing stronger as time makes us forget the pain of late nights and disappointment and thrusts the friendships and the power of trauma-forced bonds into the forefront of our memories. Elsa on the Left from the week before (click on the picture so you can see it better). Somehow we got the remake shot on the first try, even capturing the same tire marks in the grass. Pandemonium resulted when we discovered that the shot had turned out. Supreme Court. Zooming was a little off. Alex on the right with me as "spectator." That's Corey in the left picture.